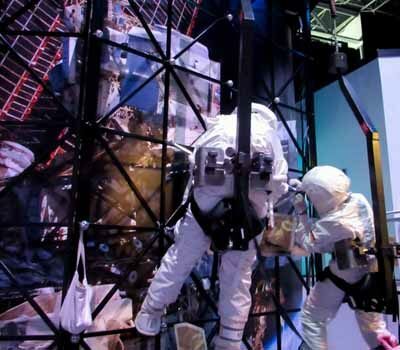 In an engaging hands-on adventure, students learn about the development of space-related technology and are lead through several simulated missions where they must work together to overcome challenges and adversities. The inspiring leadership and personal development will motivate students to possess the right attitude and passion for life. 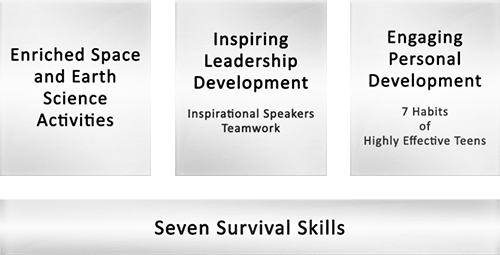 Built on the foundation of the Seven Survival Skills, the program offers three key pillars of activities including enriched space and earth science activities, inspiring leadership development, and engaging personal development. 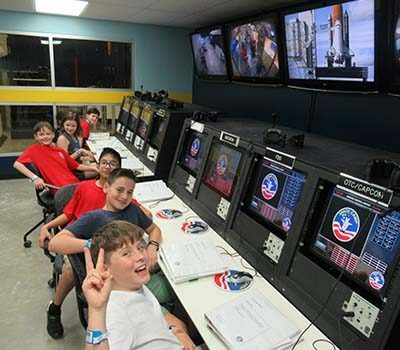 CASE Junior Space School aims to deliver students a once in a lifetime, ultimate STEAM experience, at the most inspiring organisation NASA. Returning from the expedition, students will become more focused and more inquisitive to pursue the subjects they are interested in. CASE Space School Programs are University of California (UC) approved as recognized College Preparatory courses in the USA. 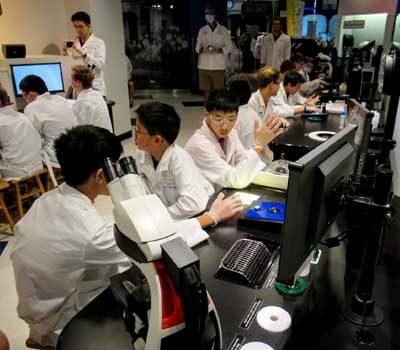 UC Approval demonstrates these courses are of high academic standard to prepare students for university-level studies. It ensures that CASE Space School graduates are identified by leading universities as high achieving, university-ready students. In the competitive landscape of university applications both domestically and internationally, students who complete CASE Space School Programs will differentiate themselves from other applicants. 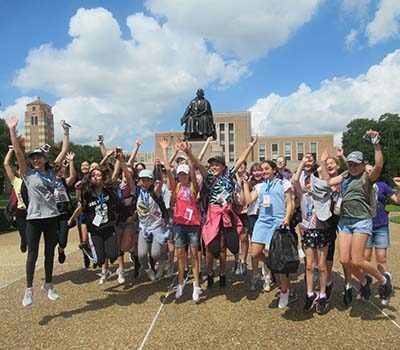 The Duke of Edinburgh’s International Award is a youth development program that empowers young people to explore their potential and learn important life skills. 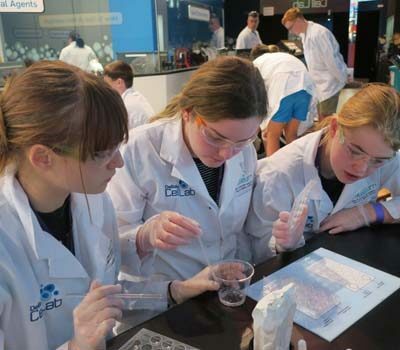 As an established provider of International Study Programs we are proud to offer CASE Space School as a way for participants to complete sections of their Bronze, Silver and Gold Awards. 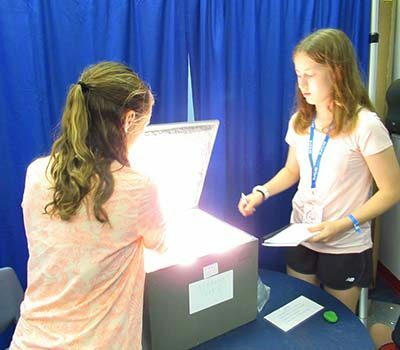 CASE Junior Space School integrates elements of space-science, medical science, marine biology, and energy to foster student interest in STEAM through experiential learning. 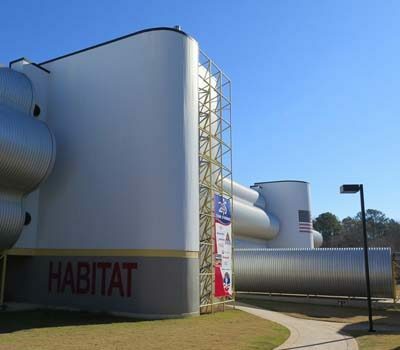 The program includes site tours of America’s leading Space centers in Houston Texas and Huntsville Alabama where students will actively take part in training exercises, simulators and lectures. 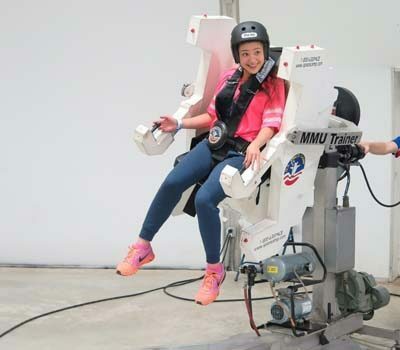 Students unleash their passion through immersive and exciting astronaut training; including the 5DF (5 Degrees of Freedom Chair) used by the Gemini and Apollo programs, MMU (Manned Maneuvering Unit) used by astronauts when performing un-tethered spacewalks, 1/6th Gravity Chair to simulate walking on the lunar surface, and the Multi-Axis Trainer to simulate disorientation experienced in re-entry to Earth’s atmosphere. 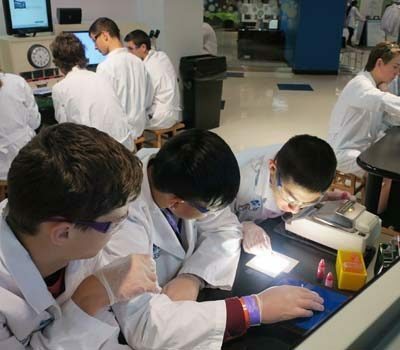 This unique and energetic experience enables students to explore their curiosity, and embrace the STEAM field with new found enthusiasm. 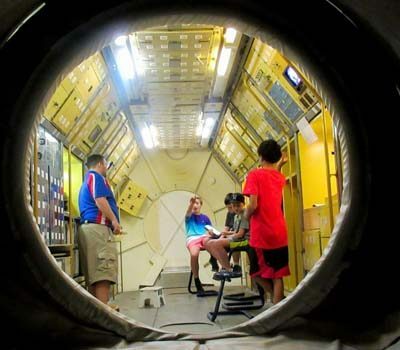 Partnered with Space Center Houston, U.S. Space & Rocket Center, Rice University and other educational institutes, the CASE Junior Space School creates a positive environment to inspire and motivate students. 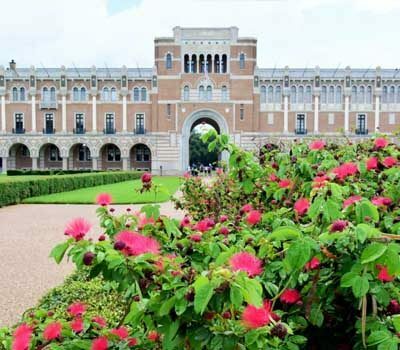 Students have the opportunity to visit prestigious locations across Houston which is not possible within the normal realm of the Australian learning environment. 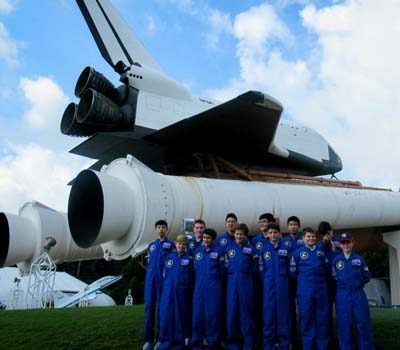 An unforgettable experience awaits all CASE Junior Space School students. 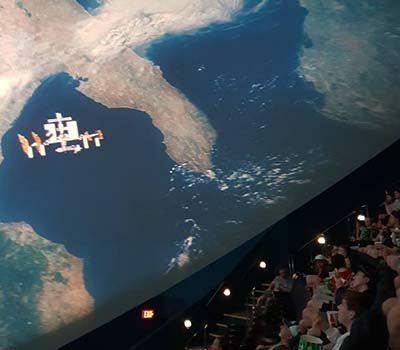 During personalised presentations and special events, students hear directly from guest speakers including astronauts, NASA scientists engineers and CASE Special Adviser Ms Nicole Stott. CASE Special Adviser, NASA Astronaut, aquanaut, engineer, and currently an Artist and SciArt education advocate. 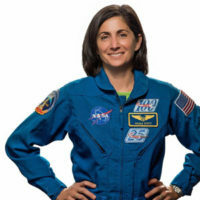 Ms Stott completed two space shuttle flights, and 104 days living on board the ISS. Nicole is the first astronaut to paint watercolour in space and is the Special Adviser to CASE. Instrument Operations Engineer at NASA Jet Propulsion Laboratory. 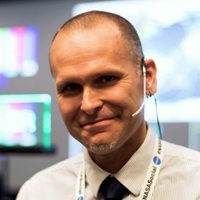 Mr Nolan's passion is educating students in NASA Earth Science. 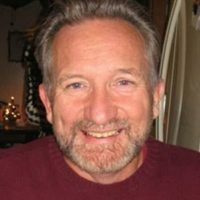 With JPL, Mr. Nolan has commanded many instruments on multiple spacecraft and was the first person to see images from the Opportunity rover on Mars. Bestselling author and founder of the 1M Mentoring Foundation, Jonathan speaks worldwide about the significance of stewardship and the principles that empower greatness in young adults. As both a parent and professional, Jonathan is committed to assisting our youth in developing their confidence and capabilities as they mature into lifelong leadership. Ms Blome has lead an inspiring career at NASA. 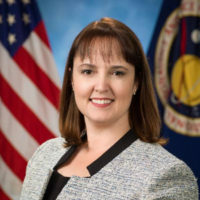 Since 1994, Ms Blome has worked with Space shuttle systems, flight controllers, space station robotics, and more; while earning a Masters Degree at the International Space University. 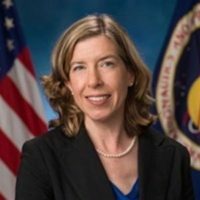 Currently Ms Blome is responsible for coordination and management of spacewalks from the United States Airlock on the International Space Station. 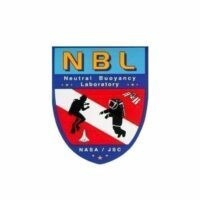 Andrew currently works at NASA's Johnson Space Center (JSC) in Houston, Texas, recently working in the Flight Operations Directorate as an International Space Station flight controller, a Station Support Computer Specialist, and a Crew Support LAN Subject Matter Expert. 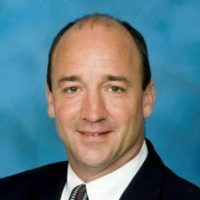 He is currently a Computer Engineer and Communications Subject Matter Expert in the Information Resources Directorate at JSC. Mrs. Duplichen is a Contracting Officer’s Representative for two integral operations. The first to ensure critical space hardware is transported to the ISS. Secondly, the management of logistics in Russia, and Russian language training, translation and interpretation. 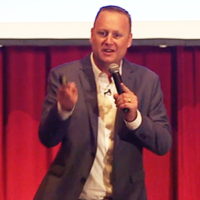 Developed by Sean Covey, the 7 Habits of Highly Effective Teens provides students with principle-based skills to improve self-esteem, build friendship, resist peer-pressure, achieve goals and strengthen core values. Students depart Australia for Houston, Texas with a flight time of approximately 20-22 hours. On arrival into Houston, students check into their hotel for an initial brief and well-earned rest in readiness for an exciting program. The scene is set on the first morning in Houston with the official Opening Ceremony. 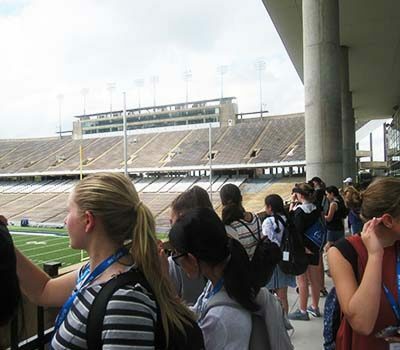 During an afternoon at Rice University, the students visit the stadium where President Kennedy gave his famous speech about travelling to the moon. 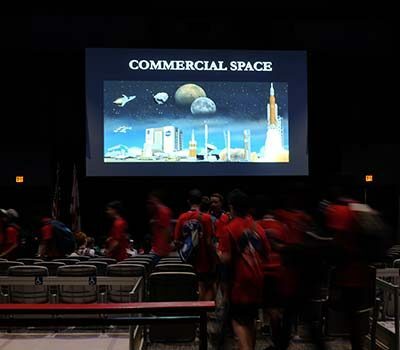 In the evening students learn the history of space exploration with the Space Race I movie night. Each day the students are energised with the mPOWER Energy Zone, Expression Zone and engaging presentation of the daily Habit sets the right mindset for each day’s activities. Students head out to conduct challenging DNA extractions at Cell Lab. The group will then enjoy a recreational evening of shopping at s Houston Mall before returning to the hotel. Following the morning activities the expedition sets off to explore the vast facilities of Johnson Space Center, NASA’s headquarters. 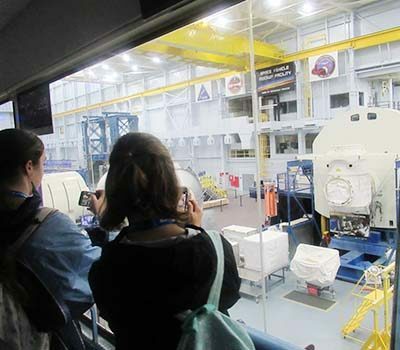 Students visit Starship Gallery, Apollo Mission Control, Saturn V Rocket and various exhibitions. 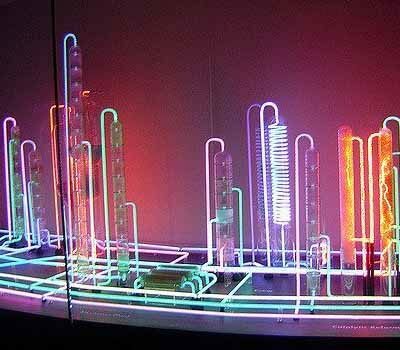 In the evening, a motivational and interactive presentation by a scientist or engineer, with plenty of question time. Morning activities are more involved as groups present the Habits with a focus on application in daily life. 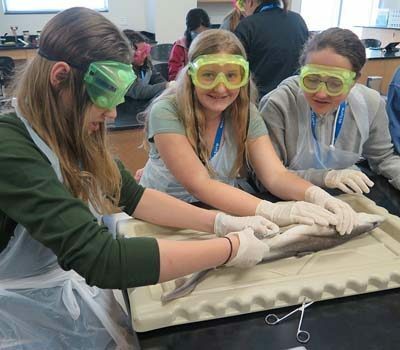 Students are introduced to marine biology. 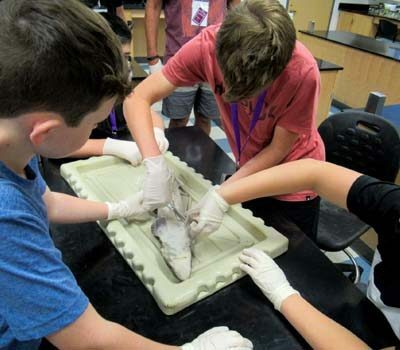 The first session discusses marine ecology and conservation before students undertake their own shark dissection. Followed by an exciting cultural experience attending a live NBA or MLB game, depending on the season. On the last day in Houston, students are in for a special treat. Morning activities first thing, then an early return to NASA’s Johnson Space Centre. 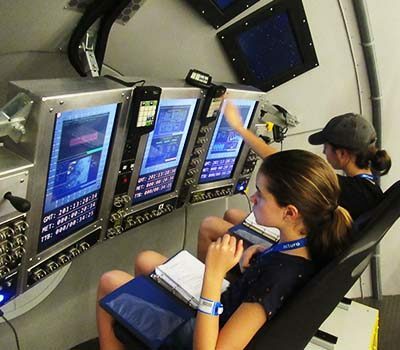 Students will tour the Astronaut Training Complex and Outer Space Academy, then attend an exclusive dinner with the CASE Special Advisor, former astronaut, Nicole Stott. Following the inspiring presentation, they have chance to ask questions and talk directly to the astronaut. Goodbye Houston, hello Huntsville! 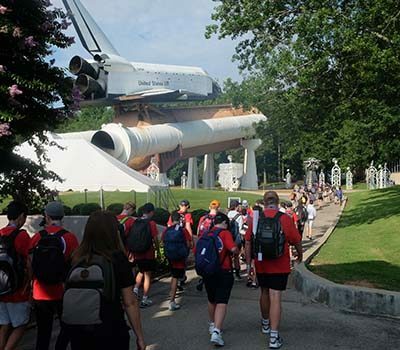 The group departs the hotel to travel to their next destination, the U.S. Space & Rocket Center (USSRC) in Huntsville, Alabama. 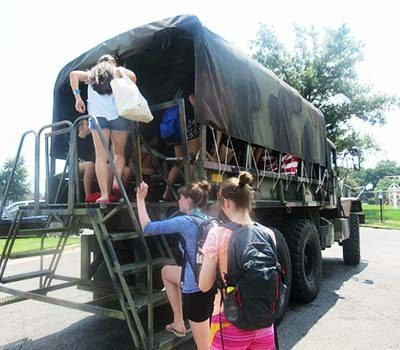 Students check in to the onsite accommodation, meet their crew trainer and tour the Center’s facilities. 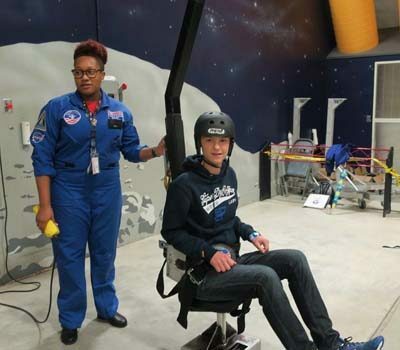 After breakfast students get straight into astronaut training at USSRC. 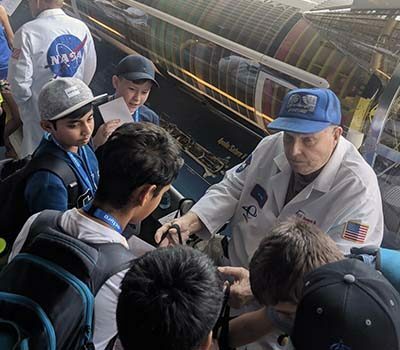 They learn about the Mercury, Gemini and Apollo Space Programs, design their own mission patch and are briefed on their own upcoming mission. 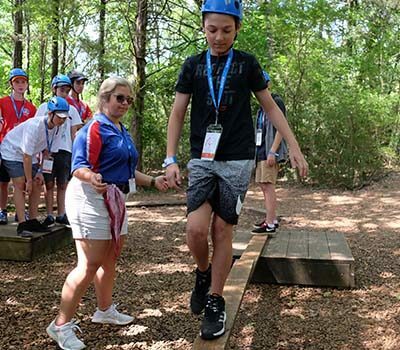 For their next challenge, they head outdoors for a lot of fun; the Area51 teamwork and leadership training course expands their critical thinking and problem-solving skills. 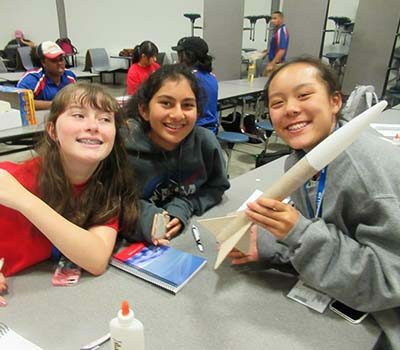 Later in the day, students receive guidance to begin constructing their own rockets and attend a presentation on Living in Space. A morning tour and activities in Rocket Park, before students are immersed in their own Apollo Mission. 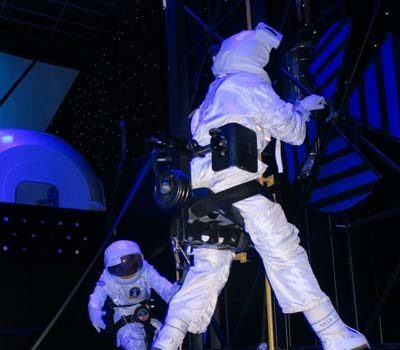 This has them taking on roles, working as a team, and performing tasks to simulate a real space mission. 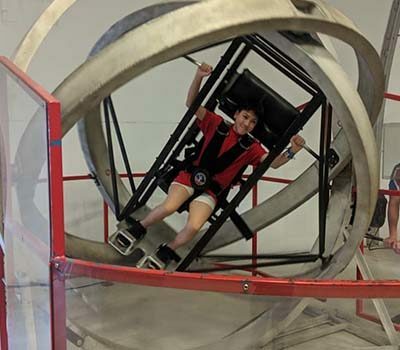 A chance to try the Space Shot trainer simulates the feeling of rocketing into space beyond the earth’s gravitational pull; and scaling the climbing wall, they can imagine they are making their way up the 22km to the summit of Mars’ Olympus Mons. 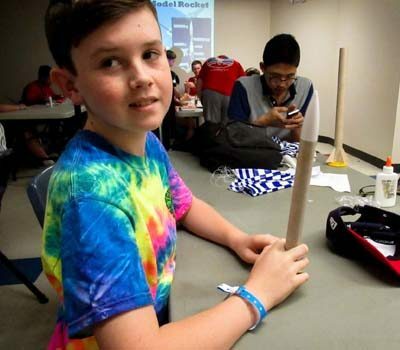 Rocket construction and testing ready for launch tomorrow. 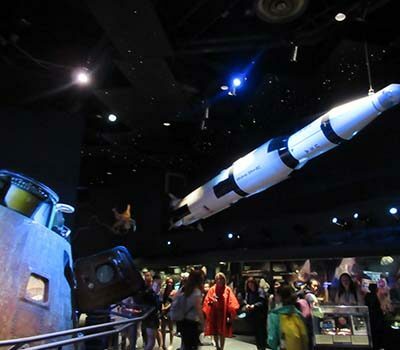 Students will view Saturn V, the most powerful rocket ever launched and used in the Apollo 11 mission, which landed man on the moon for the first time. 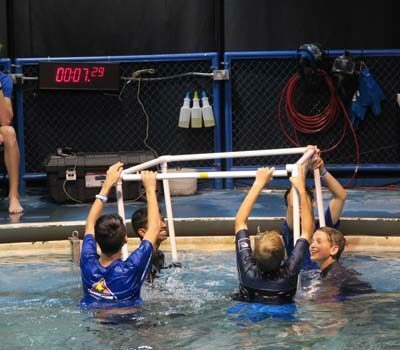 Teams experience first-hand how to work in a neutral buoyancy environment with a complex pool-based team activity. 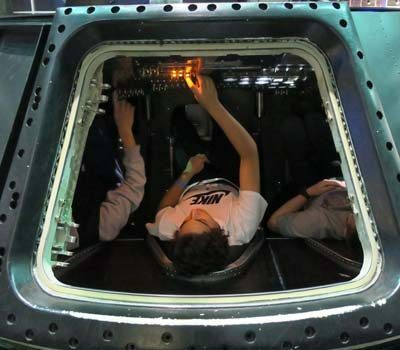 Then, they take a tumble in the Multi-Axis Trainer, designed to simulate disorientation on re-entry into the earth’s atmosphere. Today students demonstrate their knowledge, teamwork and leadership skills during their lunar base presentation and their Bravo space mission. 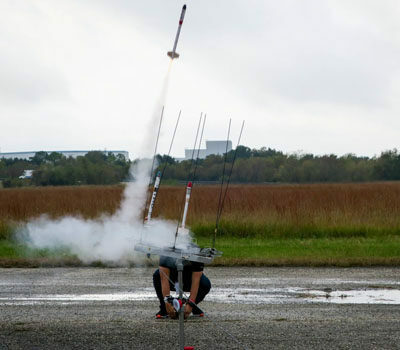 They will fine tune, test and then launch their rockets. 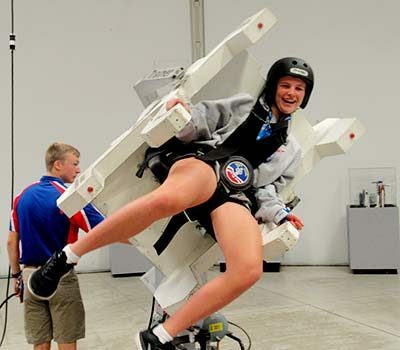 They have fun with the Manned Manoeuvring Unit, simulating the frictionless environment of outer space, and the 1/6th gravity chair to master a moon walk. The final expedition day. Today students attend the official graduation ceremony and are awarded with the CASE Space School and USSRC certificates. 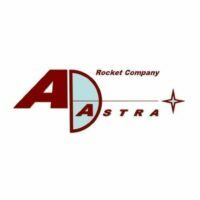 Students then depart USSRC and head to Huntsville airport for the journey home to Australia. Expedition completed! With a transit time of approximately 20-22 hours students have time to reflect on their adventure and are farewelled with a closing ceremony at the airport when the group arrives back to Australia. *Proposed program is subject to change. "I had 2 children go to CASE Space School - one to junior, one to senior - and both had the most wonderful time. Everything was well organised, the staff were great, the students were well supervised and communication was excellent. The activities were fun and interesting and unique - truly a 'once in a lifetime' opportunity. They mixed with students from other parts of Australia who shared their interests and enthusiasm. Both came back inspired and more interested in pursuing science - and wishing school science was more like this. If you get this opportunity - grab it. You will not regret it! "We are very grateful for the care and organisation provided. Thank you for looking after the boys so well throughout the trip. Our son returned home full of enthusiasm, excitement and happy memories. 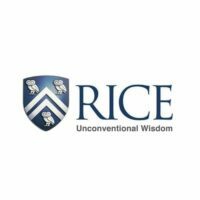 He now wants to go to Rice University !! 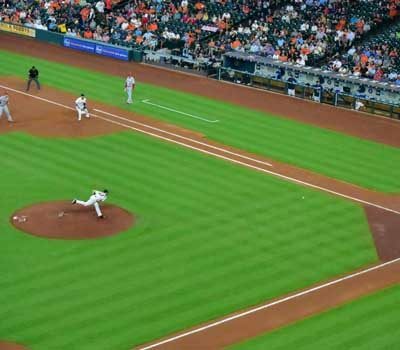 The team leaders were fantastic as were the ground staff in Houston and Alabama. We would certainly recommend the CASE Space School to others. Fantastic - thank you." "We can't thank the whole team of Actura enough for the way you treated our daughter like she was your own. Your professionalism with timely communications, all logistics and ensuring our daughters experience was nothing short of amazing was beyond anything we or she could have ever imagined. She loved being with her school buddies and has made some new life long friends with girls from other schools. 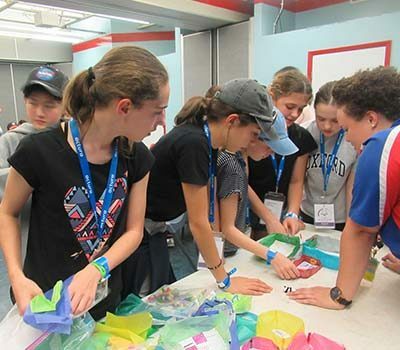 The programs delivered in all areas of experiences, leadership, exposure to STEM, inspiration and personal development. Seriously, if were up to Sophia, she'd stay another two weeks and we would have no hesitation in allowing her. She now has her sights on attending the Senior SPACE camp and we'd sign her up in a heart beat." "My daughter had a wonderful time last December. It was certainly worth the money we spent on . So much more than we expected. She found the group leaders and event instructors caring and helpful. Whole program very exciting and fun. She could not stop talking about it for weeks afterwards. It was nice to see their daily progress on photos and videos via Actura as well. Highly recommend it!" "Everything was well organised and communicated. Flynn had a ball and had his eyes opened to very many new experiences. He benefited greatly from the immersing experience and made new friendships." "My Daughter came home with many stories to tell and is still telling them. This trip exceeded my expectations as I was slightly concerned how she would cope being so far away from home and for such a long time, but she loved every minute of it and it has definitely shaped her motivation for what she would like to do in the future with her studies! Other than the obvious learning aspect she has also learnt resilience and independence, made new friends (whom she is continuing to keep in touch with) and a sense of confidence that she did not have prior to the trip." "Venice rated the experience 10/10 and her description of the different activities she was involved in sounded very rewarding for someone of her age both from a STEM perspective but also having the confidence to participate in such a program at a relatively young age"
"Lil still hasn't taken a breath telling us all about it. She wants now to be an engineer or an astronaut! Thanks to the organisers for looking after our girls!" 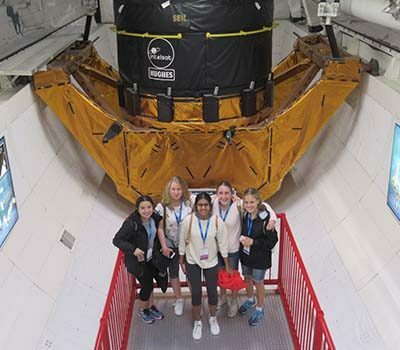 "Our daughter came back very enthusiastic about careers in science/engineering and working for NASA"
"Space School was an excellent experience for my daughter, she has come back much more confident in her self and she feels she has learnt a lot." 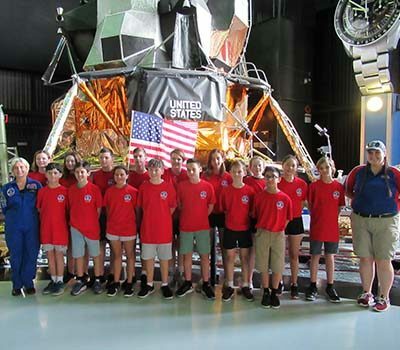 "Our children said they met some of the 'best people they have ever met' at the Houston base and National Space and Rocket center. We're very grateful for the opportunity our children had to participate in this program and be exposed to such inspiring people. Our children are noticeably more aspirational following the program. 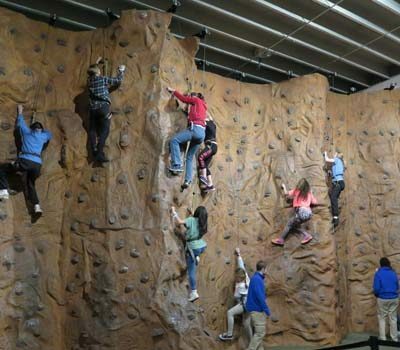 The mixed level participation in the trip was also a great benefit for our family as our children enhanced their bond during the trip (and came back more positive about each other)." "Thank you to Amy for fielding all our queries and request. Thanks to the two AMAZING group leaders who took the boys on every step of their journey. I would certainly recommend you (and have already) to anyone seeking to send their child on a quest for new learning experiences and one which promotes independence of thought. Well done to all concerned and thank-you!" 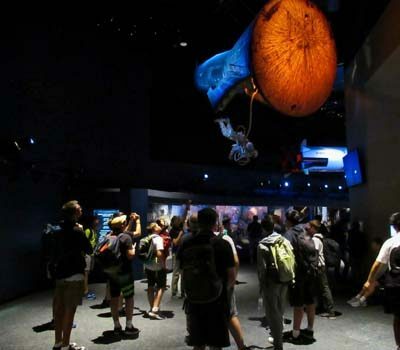 "I appreciated how thorough the organisation of the expidition was and the excellent communication with parents throughout the whole experience." "This experience has been life changing for me. It helped me to realise my goals and guided me by giving me the knowledge and support to allow me to take those steps so I can achieve my goals... It gave me an incredible learning experience to learn outside the classroom and develop practical skills, Not only did I feel very welcomed and an accepted part of both my groups but I also made new friends who i will continue to stay in touch with when the trip ends... I had such a great experience in america and got a taste of the culture too.I gained knowledge on my group , its members, myself and space. 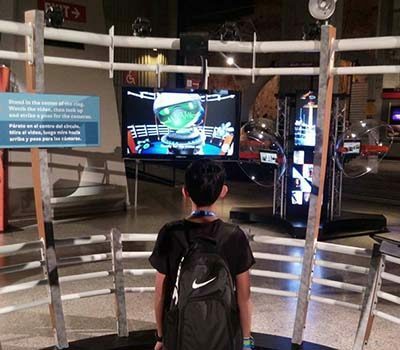 I learnt about NASA and the different occupations it is looking for as well as extended my knowledge about past space missions such as Gemini and Apollo. I definitely learned a lot in a short period of time without realising it it as it was not at all a classroom learning environment." "I learnt a lot. Not just about space and rockets but also about team, socialising, being organised and being nice and support for each other. It was a challenging journey for me because this was my first time overseas without my family but by not being with them, i learnt how to face the challenge and how to fix them by myself. I learnt lots about space and rockets by listening to amazing presentations from amazing engineers, astronauts and crew trainers. 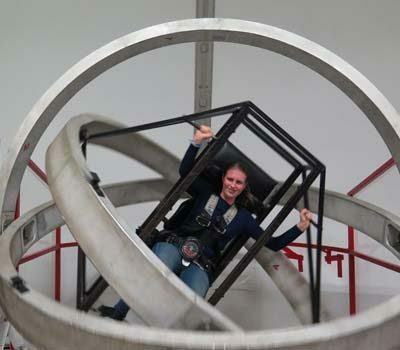 Also the multi axis trainer was amazing. Space shot, Bravo mission and many more. 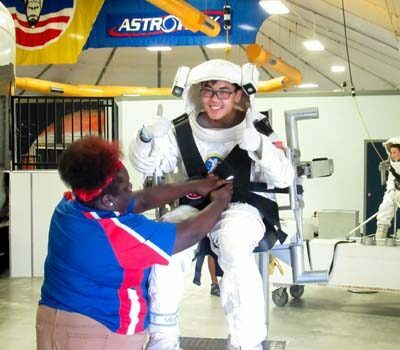 I am very lucky to be apart of these experiences that i can't do in my normal life outside of space camp." 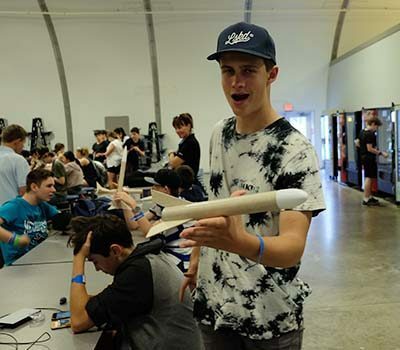 "The Space School was one of the best trips I have ever gone on and recommend to anyone interested in STEM. I have made incredible memories and met people I will never forget. I have learnt so much, enhancing my knowledge of STEM and how to be successful. 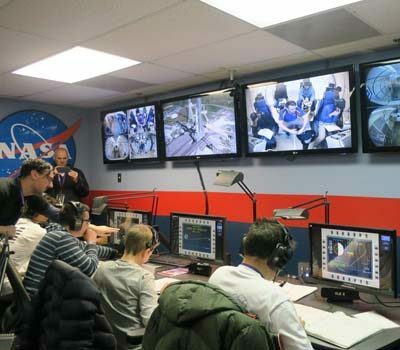 I have also learnt about the American culture and the future for space exploration. This trip has really inspired me to try my hardest in everything I do to achieve my dreams and goals. The GMs and group members made this experience 10x better and I wouldn't have enjoyed as much without them." "I absolutely loved this experience and i have gained so many things from this experience. This including friendships, Skills and opportunities. I didn't realise the amount of amazing things we have done on this trip and i am so thankful for this. Not only have i learnt about Newton's laws, How to build a rocket, astronomy, the process and development of space light and parts of a shark I have learnt other things I didn't think i would learn on this trip this including, good habits, good communication skills and new friendships. Never did i think i would gain these things from this experience. Knowledge was not just a major part of this trip but communication and teamwork as well." 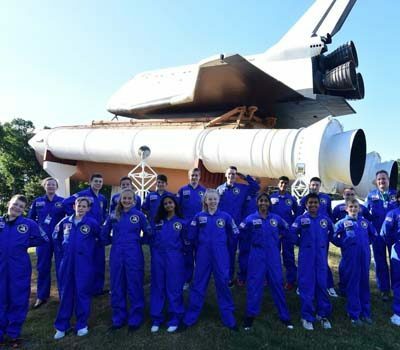 "My experience at Space School was brilliant...This trip also taught me almost complete Independence - to make my own hard decisions being organised, e.c.t I also became more resilient... I learnt to bounce back and not let it get me down for too long. Overall, this trip taught me a lot more than just Space and STEM (even though that was amazing), it also taught me some essential life skills that I am very grateful for. "I had an excellent experience. I made new friends and strengthened old friendships, met amazing people and had so much fun in all of the activities.The leaders (especially Chris) were so supportive and encouraging. I've learned not just about the wonders of space exploration but I've also learned about how to approach any challenging situations with a positive attitude. I have applied these skills already in this camp which allowed me to try a variety of new activities. My Huntsville leaders were also amazing and fun." "From the beginning to the end, there were fun activities, amazing people and supportive elders. All of the experiences made you realize how lucky we are to be on this trip. Some of these opportunities are once in a life time and you must take these opportunities with both hands and try your hardest. I have learned never to give up on your dreams and must work hard no matter what others say. Anything is possible no matter how hard your dream may be. We may think we have it all but then there is always more to learn." 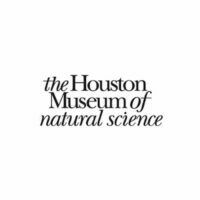 "I went to Houston expecting an exciting trip, but what i got exceeded every expectation I had. 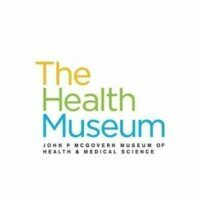 The GMs and crew trainers in Huntsville and Houston were helpful and supportive, providing a safe, enthusiastic environment in which to learn. I loved every minute of my trip and didn't want to leave when it was time to go. I learned about the mercury, Gemini, Apollo and STS program as well as the inter-nation co-operation needed to build the ISS. I got to experience working aboard the ISS and orbiter as well as take a sneak peak into the amazing work people do at NASA's mission control. I was able to fully appreciate the determination and persistence of people like Wernher von Braun who turned a thousand old dream in to reality and most importantly i learned the true meaning of what it means to be apart of the space program. 'Today's dreams are tomorrow's reality'"
"Overall, Space school has been an amazing experience. I have learnt so many new things. 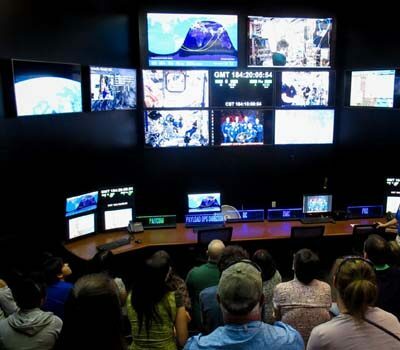 This includes the opportunities in the space industry and the different positions and roles in the control center i specifically learn about the position of "paycom" and its importance. 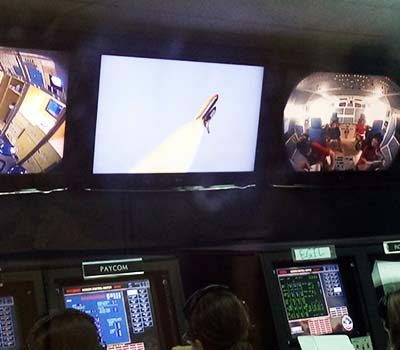 I also learnt a lot about the different Space programs and their importance. I also made lots of friends and have honestly had a awesome time. All the teachers and instructors were very nice. I would differently go again. It has differently been an amazing unforgettable time." 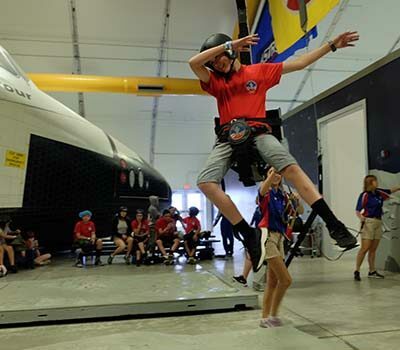 In an engaging hands-on adventure, students learn about the development of space-related technology and are lead through several simulated missions where they must work together to overcome challenges and adversity. The inspiring leadership and personal development will motivate students to possess the right attitude and passion for life. 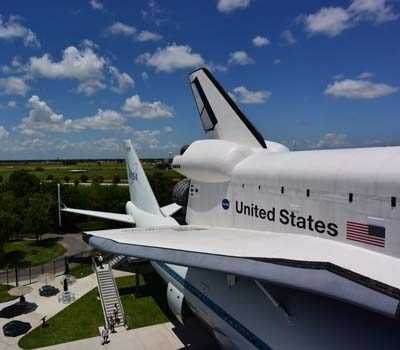 An unforgettable experience awaits all CASE Senior Space School students. 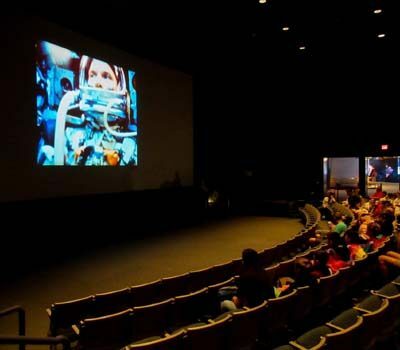 During personalized presentations and special events, students hear directly from guest speakers including astronauts, NASA scientists, engineers and CASE Special Adviser Ms Nicole Stott. CASE Special Adviser, NASA Astronaut, aquanaut, engineer, and currently an Artist and SciArt education advocate. Ms Stott completed two space shuttle flights, and 104 days living on-board the ISS. Nicole is the first astronaut to paint watercolour in space and is the Special Adviser to CASE. Each day the students are energized with the mPOWER Energy Zone, Expression Zone and engaging presentation of the daily Habit sets the right mindset for each day’s activities. Students head out to conduct challenging DNA extractions at Cell Lab. The group will then enjoy a recreational evening of shopping at s Houston Mall before returning to the hotel.